Scalloped potatoes are a great dish on their own, but if you add ham it becomes a hearty main dish in an instant. All you have to do is throw together a salad or warm up a veggie and dinner is done. We had ours with roasted asparagus and it was delicious! Here's the thing, though. You can keep a secret right? Matt is convinced that he doesn't like scalloped potatoes. So I didn't tell him what he was eating. When he asked what was for dinner, I answered "I dunno, some leftover thing I threw together." It's my standard answer anyway, not everything has a name! So he ate it unknowingly.... and went back for seconds! Grease a 3.5 quart casserole. In a large skillet over medium heat, melt the butter. Add the onions and cook until translucent. Stir in flour and cook for 2 minutes. Slowly add milk, stirring as you go to avoid lumps. Cook until it begins to thicken. Remove from heat, stir in salt and pepper and set aside. Thinly slice the potatoes. 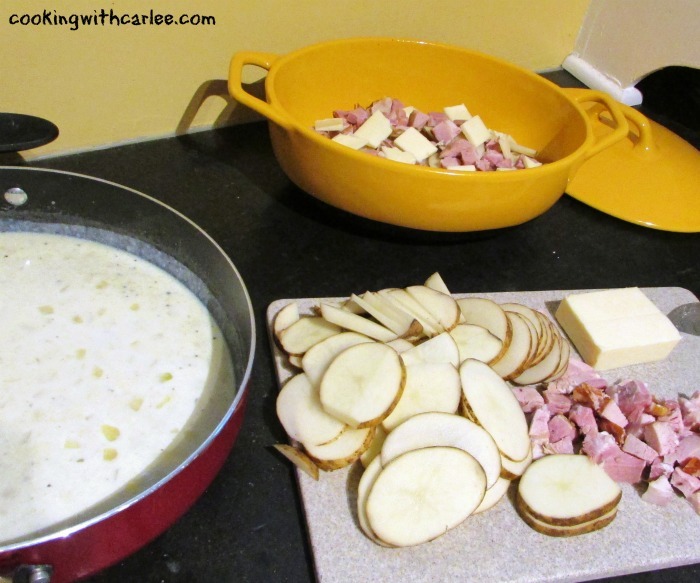 Layer half the potatoes in the prepared baking dish.Then add half the ham, half the milk mixture then half the cheese. Repeat with the remaining potatoes, ham, milk and finish with the remaining cheese. Place the lid on the dish or cover with foil and bake for 45 minutes. Remove lid and bake for an additional 25 minutes. Top with a little additional freshly ground pepper and let rest for 10-15 minutes before serving. Nope you're not alone, I like reworking leftovers too and always add left over ham to scalloped potatoes or make ham and beans. With ham especially the possibilities are endless. Your recipe looks fabulous!! Thank you! I love ham and beans too! There are so many fun things you can do! Often times the recreate are every bit as good as the original meal! Thanks! 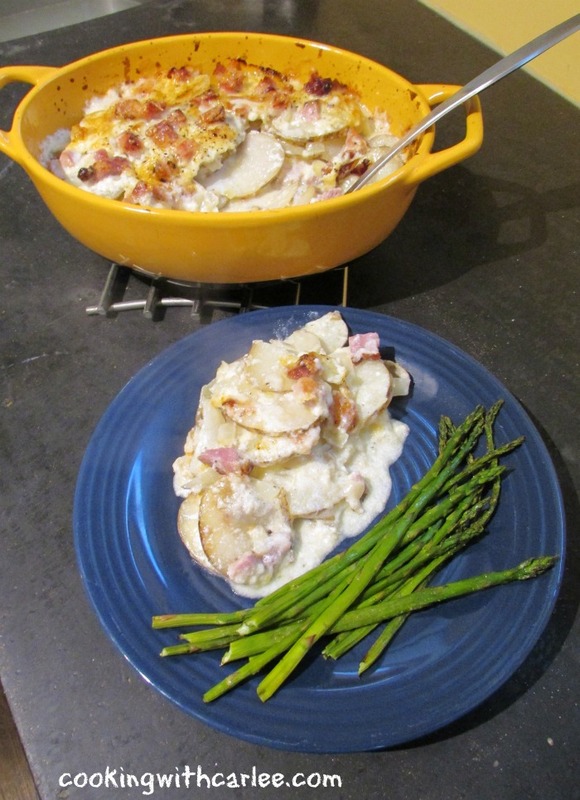 Your scalloped potatoes with ham looks delicious. I need to try it!!! 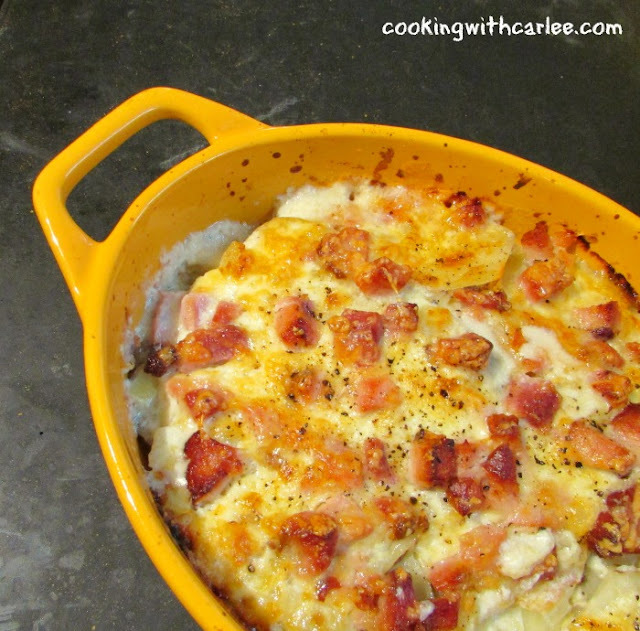 Gotta love a good scalloped potatoes and ham recipe. Thanks for linking up to the Easter Leftover Makeover Blog Party!